Many observers have been puzzled by the €235m tax credit which NAMA showed for the first time yesterday in its Annual Report. Not only was such a credit omitted from the provisional 2011 accounts, but the booking of the credit at this stage presupposes that NAMA makes profits in the future – which it may, though with a deteriorating loan book and asset values declining in its primary market, that is not assured by any means – and there have been suggestions that NAMA is incorrect to book such a credit as it is not subject to corporation tax. The effect of the €235m tax credit was to bolster the marginal pre-tax profit of €11m to the €247m reported across most media – I say a “marginal” pre-tax profit because any accountant worth their salt can tweak provisions and estimates and in the context of a €30bn business, finding €11m extra of profit or a €11m reduction in losses or provisions shouldn’t be a gargantuan challenge. This blogpost examines the tax credit in more detail. Firstly although section 214 of the NAMA Act states that NAMA is not subject to corporate or income taxes, that provision appears not to apply to NAMA group companies. 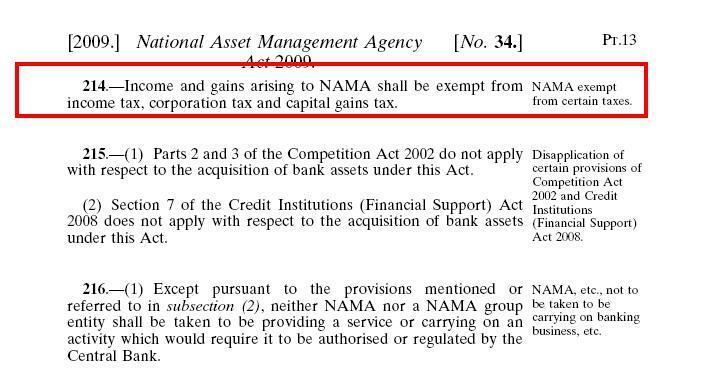 This one sentence section 214 might benefit from further investigation as presumably NAMA is subject to taxes in other jurisdictions, and it is not clear why NAMA group companies would not benefit from this provision. In 2010, there was a tax charge also in the provisional accounts of €380,000 so the charge of €375,000 in the final accounts for 2010 didn’t come as a surprise. In 2011 however, there was no provision whatsoever for tax and yet in the final accounts, there was a whopping big €235m credit. NAMA has thus far run up a stonking big loss and when it comes to the taxation of companies, they can carry forward a loss from one year to offset against profits in a future year. 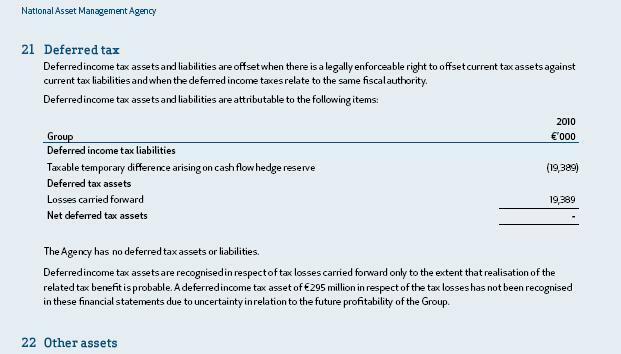 So simplistically speaking, if Company A makes a loss of €1,000 in 2010 and a profit of €1,500 in 2011, then in principle Company A can offset the €1,000 loss from 2010 against the 2011 profit, and only pay corporation tax on the cumulative profit of €500. So Company A in 2010 won’t pay any tax in that year, but will Company A estimate the future benefit of the loss it has made in that year? If Company A is confident it will make future profits then it may book a “tax credit”, but you would have to ask why? If 2010 was its first year of operation, then it wouldn’t get paid a refund of tax from the Revenue Commissioners. The only reason you would publish a tax credit, it seems, is optics. NAMA says it is confident of generating profits in future years so that the “tax credit” it has recognised in 2011 can really be used to offset any tax liability. The view on here is the “tax credit” was recognised now purely for optical reasons, and that given the precarious condition of NAMA’s main market, Ireland, it flies in the face of the accounting concept of prudence to recognise the “tax credit” in these circumstances. 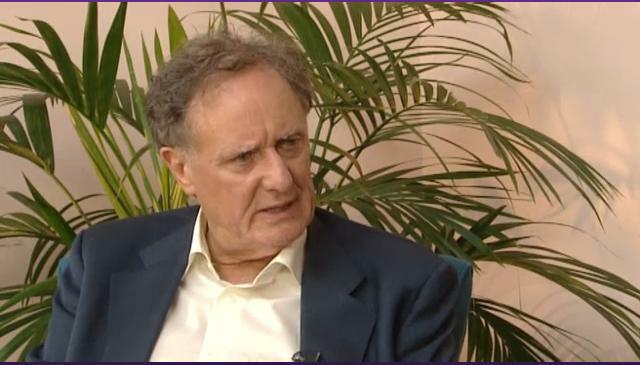 Vincent Browne: Frank, how can you say you are absolutely confident? Surely, what you mean is that you hope, and the hope would be based on, that there would be a hope that there would be a recovery in property prices. Frank Daly: That’s not hope Vincent. That is taking the same way any other business, the same way the State, the same way anybody will look at the economy, look at the assets it has, look at its projected cash flows, and do that on a very objective basis. That’s not hope. FD: I think if you take a look at recent indices for property prices, and I acknowledge that there are no perfect indices but I certainly think that the level of decline has begun to bottom out. Now what I think you are glossing over is that there is another seven or eight years to go in NAMA, and in that seven years in aggregate, property prices recover by something like seven, eight, nine, 10% which is not an unreasonable proposal, remember recently the Central Bank indicated that property prices may have actually fallen below their economic level. VB: And they were wrong, again, yet again. FD: And the month before last, the CSO indices showed that prices were beginning to rise in Dublin for example. VB: And the most recent indications are that they’re beginning to fall. FD: You’re never going to get a V-shaped recovery in that. VB: Never mind a V-shaped recovery. Even if you get a straight-line recovery, that’s an improvement on what is happening in the property market at present. To say that you are absolutely confident that you’ll get back more than what you paid for these assets, is like, misuse of words if you don’t mind me saying, Frank. What you mean is that you hope. FD: What I’m saying is that based on our projections, our analysis, we are confident. And that’s an objective view of projections, figures, macros and not all our own. Looking at others. 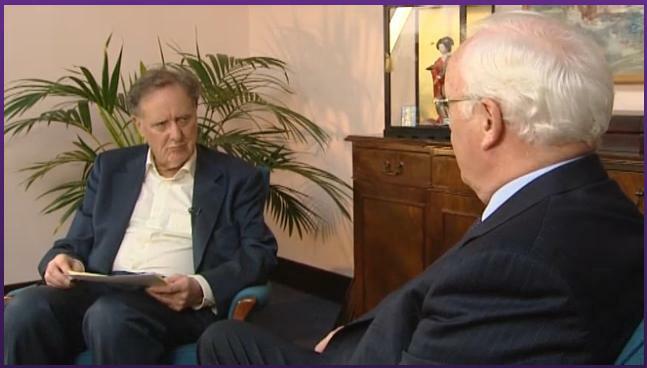 After the launch of the NAMA 2011 Annual Report yesterday, veteran journalist Vincent Browne interviewed the NAMA chairman Frank Daly, at the NAMA HQ in Dublin – the interview forms part of last night’s Tonight with Vincent Browne available here. The hard-working people at thebroadsheet.ie have prepared a partial transcript of the 30-minute interview which is available here. The extract from the interview reproduced above is additional to the Broadsheet extract. We learn that NAMA can be confident in its projections for the property market because … it has macros. For the spreadsheet-literate amongst you who have had the dubious privilege of coding macros on Excel, you are now probably rolling around on the floor laughing. Macros are little more than formulaic calculations and if we could design macros to accurately predict property prices, we’d all be billionaires. The regular audience on here won’t really have learned anything new from the interview, which is not to say that Vincent didn’t try to push certain issues. 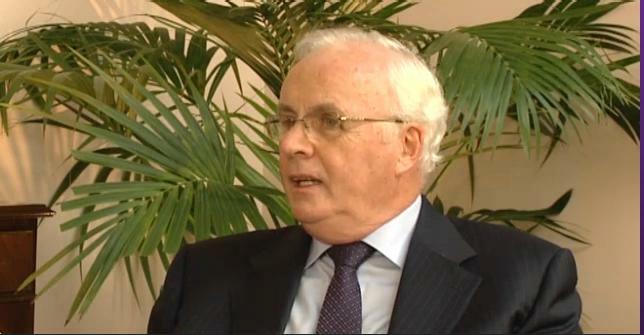 But at this stage, the NAMA chairman could probably swat away most questioning in his sleep. But whilst we didn’t learn very much, the interview has amusement value. For those of you wondering what NAMA spent €825,000 on in 2011 when it booked this sum for “lease improvements” in its accounts, you probably get an answer from this interview – they spent it on potted plants! Poor old Vincent and Frank look as if they’re in a jungle! They may also have spent it on teensy-weensy nursery school chairs for their developers to sit in when they come in to negotiate deals with the Agency – psychological intimidation some might say. Vincent Browne was given such a nursery chair last night. What is insidious was NAMA’s claim that property markets just need improve by 6-10% over the next eight years for NAMA to break even. This is rubbish. NAMA is running up costs at €200m per annum and needs pay interest of €500m on its bonds. NAMA generates about €400m per annum on its loans from debtors. So NAMA needs see an increase in property values of at least €300m per annum just to cover its costs. And the view on here is NAMA needs see an increase of closer to 24% (see NWL index above) AND cover its ongoing costs, before it will break even. Elsewhere Frank says that the rate of decline in the property market is bottoming out! Note, he is not saying that declines are bottoming out, just the rate of decline is bottoming out. And in response to accusations that NAMA is a gravy train for professionals and that the Agency is supporting Croesusian levels of income for the professional classes, the hawkish Frank says “I hope they will say that we have beaten them down on fees over the past couple of years” Feeling reassured. The programme also contains reaction to the NAMA Annual Report from Dr Constantin Gurdgiev and Gavin Sheridan at thestory.ie who has an ongoing freedom of information case against NAMA presently being heard at the High Court. 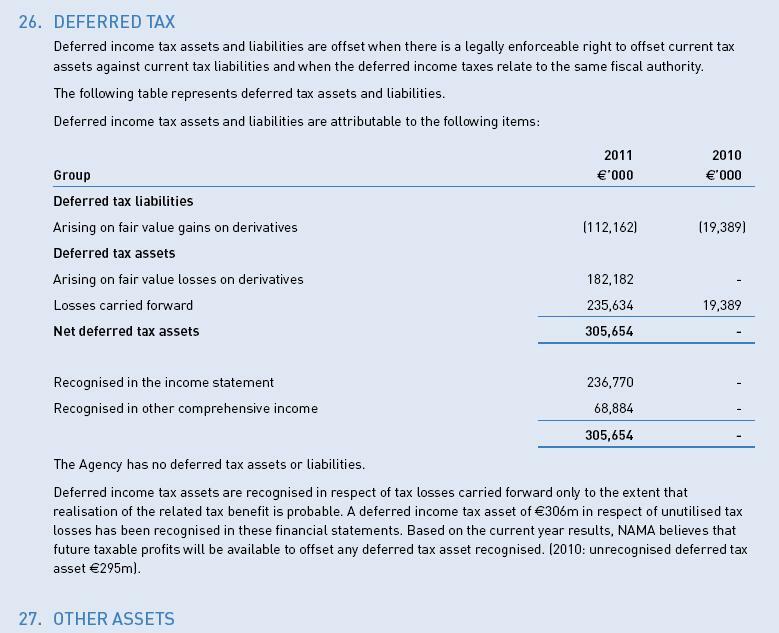 How did NAMA manage to magick up €200m of extra income in its 2011 Annual Report compared with its provisional 2011 accounts? The 2011 Annual Report produced by NAMA yesterday really shouldn’t have been very surprising to us. After all, we had the unaudited accounts for 2011 at the end of May 2012, and you might just have expected the odd tweaking of figures in the final report – after all, other than the impairment provision, that was our experience in 2010. But there were three major differences yesterday(illustrated in the table above which shows the audited and provisional results for 2011 and 2010) – the €467m increase in the impairment provision, the €235m tax credit and the third is the focus of this blogpost, the €200m of additional profit booked. Now the impairment provision published in the unaudited accounts at the end of May 2012, was indeed “provisional” and NAMA made it clear that the €810m impairment provision then reported would be subject to scrutiny from the Comptroller and Auditor General – the CAG is responsible for auditing NAMA’s accounts. 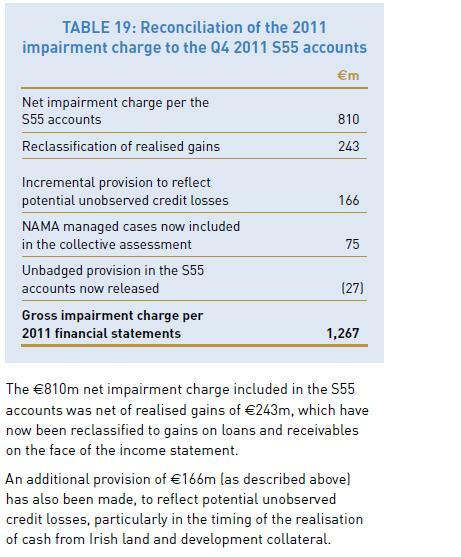 And we know in the previous year’s accounts for 2010 that the CAG increased the impairment provision from €1bn in the provisional accounts to €1.485bn in the final audited accounts, so we knew that for 2011 when we saw the provisional accounts in May that the impairment provision could change, and change substantially. No great surprise there. What is regarded as suspicious on here is the €235m tax credit, which will shortly be the subject of its own separate blogpost. This blogpost focuses on the additional €200m other income which was “found” between the provisional accounts and the final accounts published yesterday, and I use the air quotes in “found” because normally when you produce the provisional accounts three months after year end – NAMA produced its Q4,2011 provisional accounts on 31st March 2012 and they were published at the end of May – you have a very good fix on income. Take a look at the previous year, 2010 and you will see how little change there was between the provisional and audited accounts. So where did the extra €200m of income come from? NAMA was asked earlier today, and there is as yet no response. The Annual Report doesn’t offer any clue. The income reported just happens to be €200m more than in the provisional accounts. It is a fact that the Paddy McKillen case against NAMA – where Paddy was claiming NAMA’s sale of the €800m Maybourne loans to the Barclay brothers was unlawful – was seemingly settled in June 2012, when Paddy lost his appeal in London, and it might be that NAMA had refrained from booking any profit on this sale until the matter was settled. But having said that, NAMA apparently paid close to the book value for these loans, so it would be surprising if there was €200m of profit available there. Also, the NAMA accounts were signed off on 27th June 2012 – that is the date of the NAMA CEO and chairman’s signature on the accounts – and we only learned of Paddy’s defeat in Britain’s appeal court on the morning of 27th June, 2012. So if the late recognition of profits on the sale of the Maybourne loans has contributed to the enhanced profit at NAMA, then the Agency was cutting it very fine indeed! If it weren’t for the fact that the NAMA accounts are audited by the Comptroller and Auditor General which hopefully hasn’t been the victim of “regulatory capture” by having 10 staff permanently on site at the NAMA HQ, then there might be suggestions of shenanigans at NAMA motivated by a desire to show positive results at the Agency. Or more precisely, some massaging of provisions including provisional profit on some sales which has not yet been recognised by NAMA. Still, with an accountant’s cap on, and in light of the relatively minor changes in the previous year’s reporting of provisional and final audited results, it looks odd. UPDATE: 26th July, 2012. Thanks to commenter Ahura M below who points out that NAMA has provided a reconciliation between its provisional impairment reported at the end of May 2012 and the audited impairment, and this shows that NAMA, when it was preparing its provisional accounts, deducted a gain on the disposal of loans/property of E243m, and that NAMA has now reclassified this. So, one mystery solved! His legacy in Ireland might be buried beneath receiverships and personal judgments, but it seems that the former Baron of Ballsbridge, Sean Dunne and his wife, Gayle, are still in the game. The US property website Zillow is reporting that a property associated with the Dunnes has sold for USD 5.5m (€4.5m). 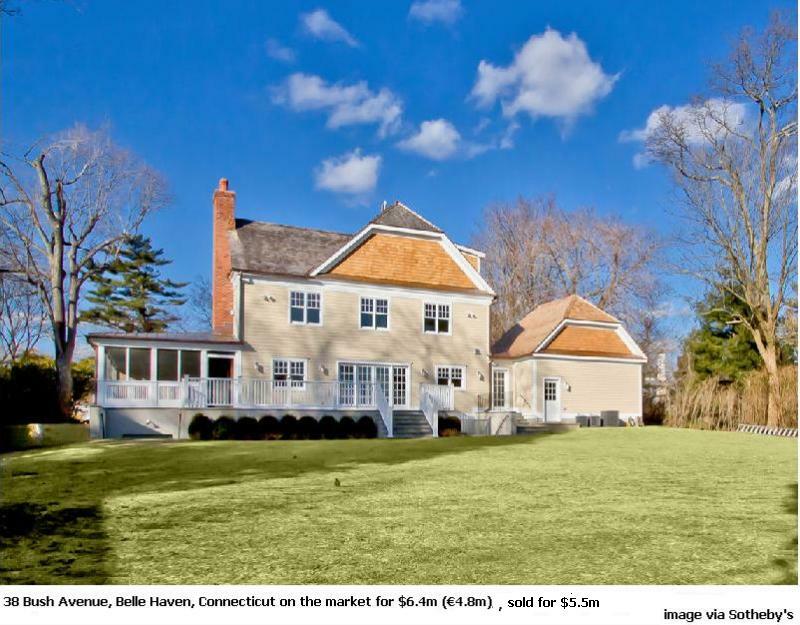 It should be made clear that Sean has previously denied involvement with the property at 38 Bush Avenue, Belle Haven, Greenwich, Connecticut CT 06830 but it does seem that the property was owned by a trust associated with the Dunnes. Here is a video of the Dunnes being door-stepped at the property under construction in 2011 – they’re clearly not happy with being filmed by a local journalist. The property was bought for USD 2m in 2010, according to Zillow and underwent extensive remodelling – the neighbours claimed the Dunnes’ “remodelling” was so substantial that they were really demolishing the existing house and building a totally new home. Neighbourly planning disputes ensued but eventually, the demolition and re-build proceeded. The property had been offered for sale by Sothebys for USD 6.4m, so the USD 5.5m price might represent a slight disappointment, but set against a USD 2m purchase price and even accounting for a new build, the owners – the trust and the beneficiaries of the trust – should be walking away with a profit.